Be the first to share your favorite memory, photo or story of Burnell. This memorial page is dedicated for family, friends and future generations to celebrate the life of their loved one. 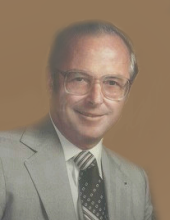 Burnell R. “Bernie” Kautzer, age 91, of Sheboygan, passed away Thursday, January 31, 2019 at Sheboygan Senior Community. He was born April 10, 1927 in Sheboygan to Alfred and Olivia (Muetzelburg) Kautzer. He attended Washington Elementary School in Sheboygan, was a graduate of North High School (Class of 1945), where he excelled in football and basketball. Upon high school graduation, Bernie enlisted in the US Navy and served his country during WW II aboard the USS PCE 885 in the Asia-Pacific Theatre operating between the islands of Guam and the Philippines. After the war he continued his service in the US Naval Reserve. After graduating from Sheboygan Business College, he began his forty-three year career with the Kohler Company, primarily in corporate accounting. He was a member of the Kohler Quarter Century Club, retiring in 1992. On January 26, 1952 Burnell was united in marriage to Virginia “Ginny” Schaub at St. Dominic Catholic Church Parsonage in Sheboygan. During their fifty-eight year marriage the couple enjoyed numerous trips to the Caribbean and especially to the island of Jamaica. They had many family gatherings and celebrations through the years. Ginny preceded him in death on July 21, 2010. He enjoyed fishing and took many memorable trips with his fishing buddies to Canada, Minnesota, and many Wisconsin lakes and rivers. Burnell was an avid and loyal Green Bay Packer and UW football fan. He was a member of the semi-pro Sheboygan Redwings football team. He was an honorary member of the Sheboygan Knights of Columbus, serving as Financial Secretary for many years. Burnell also liked Big Band and Polka music. Bernie was currently a member of Holy Name of Jesus Catholic Parish. Survivors include his four children, Gary Kautzer of Wauwatosa, James (Karen) Kautzer of Sheboygan, Gail (Jerry) Basler of Columbus, WI and Julie (Derrick) Walker of Sheboygan; his eleven grandchildren, Austin, Dana, and Regina Kautzer, Stephanie (Nathan) West, Laura (Andy) Nighbor, Nathan (Meghan) Kautzer, Andrew (Kay) Basler, Claire (Scot) Pennell, Travis (Amber) Basler, Marshall and Paige Walker; and his eight great-grandchildren. He is further survived by his sister, Shirley Hasenstein of Sheboygan and other relatives and friends. In addition to his parents and wife, he was preceded in death by his brothers-in-law, Raymond Hasenstein and Henry Schaub Jr; and his sister-in-law, Lucia Schaub. A Mass of Christian Burial will be celebrated on Saturday, February 9, 2019 at 11:30 am at Holy Name of Jesus Catholic Church. Rev. Matthew Widder, Pastor, will be the Celebrant. A time of visitation and support will be held at the church on Saturday from 10:00 am until the time of Mass. Entombment with full Military Honors will follow at Calvary Cemetery. Bernie’s family would like to thank the caring staff at Sheboygan Senior Community during his two year residency. To send flowers or a remembrance gift to the family of Burnell Kautzer, please visit our Tribute Store. "Email Address" would like to share the life celebration of Burnell Kautzer. Click on the "link" to go to share a favorite memory or leave a condolence message for the family.